So you figured out the status of a work you or a patron want to access. This page provides tips on the if and how of fair usage. 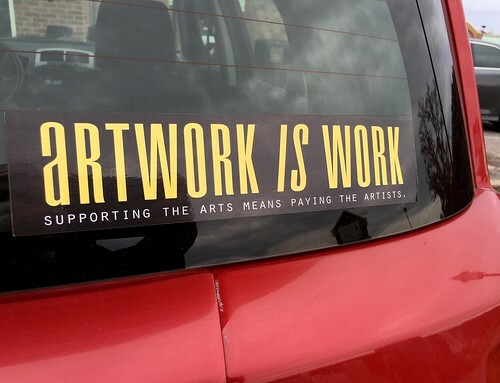 Artwork is work: Supporting the arts means paying the artists — sticker designed by Michael Bockoven. Artists, inventors, researchers, students, enthusiasts — creators deserve attribution, and those who make a living from such effort and works should earn fair economic compensation. But what is fair use of others’ works? There are four factors when assessing fair use: purpose of use, nature of copyrighted work, the amount used, and potential market effects. In addition, the posts on DRM and the DMCA, finding public domain and DRM-free content, and copyright information literacy will also help! Big Win For Fair Use In Google Books Lawsuit (C. McSherry, 16 October 2015). Authors Guild Drops HathiTrust Case (A. Albanese, 8 January 2015). HathiTrust Digital Library Wins Latest Round in Battle With Authors (J. Howard, 10 June 2014). Center for Media & Social Impact (CMSI) has a huge collection of documents on fair use — best practices, teaching materials, etc., for visual arts (video, film, television, documentaries), journalism, and much more. Can I use that picture? 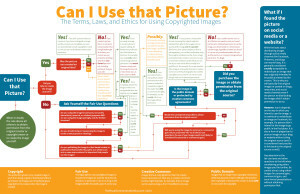 The terms, laws, and ethics for using copyrighted images, by Curtis Newbold (14 July 2014) provides a handy visual guide on determining fair use of images. Special Collections and Archives in the Digital Age, published by ARL in June 2012 provides guidance on digitization, permissions, donor agreements, etc., for libraries, museums, archives, and other special collections. Born Digital: Guidance for Donors, Dealers, and Archival Repositories, by the Council on Library and Information Resources (CLIR, 2013). Northeast Document Conservation Center (NEDCC) is well known for helpful guides on preservation in both analog and digital media. Jisc (formerly called Joint Information Systems Committee), while based in the UK, offers detailed infokits and guides on management and digitization projects. Newbold has another useful article and accompanying infographic, Did I plagiarize? The types and severity of plagiarism violations (16 September 2014). Final Report from the Conference on Fair Use (CONFU) in 1998 had a conservative take on educational use of multimedia. University of Minnesota Libraries’ Thinking Through Fair Use tool offers a helpful form and checklist on how to gauge fair usage, using the four factors of evaluation. Stanford University offers additional tools for teaching, as well as tips on permissions, and best practices for archivists, media studies, dance materials, cinema, and more. Web2Rights’ calculator helps assess risk for open education resources. Do look at the thorough the provisions checklist 6.8 on pp. 127-128. If you’re concerned about fair use of music and audio works, definitely read Dwayne K. Butler’s “Music and Copyright,” chapter 15 (pp. 111-118) within Kenneth D. Crews Copyright Law for Librarians and Educators: Creative Strategies & Practical Solutions (3rd edition, 2012, ALA). An important term to understand is nondramatic — which is not the same as nonfiction! Nondramatic refers to works with implied or explicit performance aspects. For instance, text-to-speech reading from screen readers (VoiceOver on Mac OS X/iOS, JAWS on Windows) and automated/generated read aloud feature of readers and electronic devices would likely be considered nondramatic. By contrast, audiobooks would likely be considered dramatic, as they are often read as a performance, like a radio play, opera, and so on. The TEACH Act of 2001 (House & Senate bills for Technology, Education, and Copyright Harmonization) outlines copyright and fair use for educational contexts. Association of American Publishers vs. Georgia State University: Georgia State was able to maintain the vast majority its electronic course reserves. Association for Information and Media Equipment vs. University of California, Los Angeles: The judge threw out the case against UCLA concerning streaming video for online courses. US Copyright Fair Use Index is a searchable database on cases regarding fair use and copyright. Stanford has useful fair use case summaries, organized by media and format. Unfortunately, cases of copyright infringement in music have been stringent,often favoring the copyright holder. How to determine fair use by Sarah Liberman is licensed under a Creative Commons Attribution-NonCommercial-ShareAlike 4.0 International License. Irony that article on copyright and fair use shows photo with misattribution of design of bumpersticker and incorrectly attributed artist didn’t set it straight. So the real artist isn’t getting paid. Totally, Milos! I’ll edit the image’s caption with that in mind, by linking to the Laughing Squid article that corrects attribution.